“Submit to one another out of reverence for Christ” (Ephesians 5:21). Ask the average Christian what he thinks of when he hears the word “submission” and generally the response will have something to do with marriage-particularly the attitude and actions that a wife should have toward her husband. One reason for this, of course, is that the Bible does refer to wifely submission. On three occasions, Paul exhorts wives to “submit to your husbands” (Ephesians 5:22; Colossians.3:18; Titus 2:5). Peter does the same in his first epistle (1 Peter 3:1). “Therefore encourage one another and build each other up” (1 Thessalonians. 5:11). The Apostle Paul had one important concern that was constantly on his mind and heart-to do all he could when he could to build up the body of Christ. And knowing he could only do so much as an individual, his strategy was to transfer this concern to others-to encourage every other Christian to develop the same concern for all other Christians (Colossians 2:2; 4:8). Paul’s concern, of course, forms the basic purpose of this series of articles: to provide believers with biblical and practical guidelines for developing a functioning church. In short, to help Christians build up and edify one another. “Bear one another’s burdens, and thus fulfill the law of Christ” (Galatians 6:2, NASB). Dealing with sin in the lives of fellow believers is one of the most difficult tasks God has given Christians. It’s much easier to carry out the other injunctions relating to body function. Consequently, many churches ignore this responsibility entirely. Others treat it lightly. Still others deal with the issue of sin only rather than with the individual or individuals involved. What does the Bible say about the subject? This was Paul’s primary concern when he exhorted the Galatians to “carry each other’s burdens” (Galatians 6:2). This should not surprise us since he had just discussed in detail what it means to keep in step with the Spirit rather than to engage in the acts of the sinful nature. “You, my brothers, were called to be free. But do not use your freedom to indulge your sinful nature; rather, serve one another in love” (Galatians 5:13). Freedom emerges as a major theme in Paul’s letter to the Galatian Christians. No longer are they to “let themselves be burdened again by a yoke of slavery” (Galatians 5:1). Formerly, they-along with the whole world-were “prisoners of sin” (3:22). The Law of God thundered from Sinai did not set them free from sin. It simply made them more aware of how captive they were to their old natures. Throughout the years that followed, the law of Moses became God’s means “to lead us to Christ that we might be justified by faith” (3:24). It was Christ who fulfilled the requirement of the law-death. Thus Paul could write to the Galatians: “It is for freedom that Christ has set us free” (5:1). “Greet Priscilla and Aquila. . . . Greet also the church that meets at their house. Greet my dear friend Epaenetus. . . . Greet Mary, who worked very hard for you. . . . Greet one another with a holy kiss. All the churches of Christ send greetings” (Romans 16:3-6, 16). These folks represent only a few people whom Paul greeted personally as he closed his letter to the Roman believers. In fact, he mentioned 26 people by name, and his exhortation to “greet one another with a holy kiss” represents only one of five such exhortations in the New Testament letters (see also 1 Corinthians 16:20; 2 Corinthians 13:12; 1 Thessalonians 5:26; 1 Peter 5:14). “And concerning you, my brethren, I myself also am convinced that you yourselves are full of goodness, filled with all knowledge, and able also to admonish one another” (Romans 15:14, NASB). Some of the most significant relationships I’ve developed over the years have resulted from experiences in which I’ve had to confront another Christian about his sin It has never been an easy task (I dread it every time). Yet in the end it usually (not always) has been a very emotionally and spiritually rewarding task. Furthermore, it always provides me an opportunity for personal, psychological and spiritual growth. I inevitably end up evaluating my own Christian life-style and frequently discover I need to make some changes too. As mentioned last time we are looking at the command to “Accept One Another.” One of many commands that can only be fulfilled in the believers life if they are connected to and in fellowship with others in a local church. “Accept one another, then, just as Christ accepted you, in order to bring praise to God” (Romans 15:7). I grew up in a church where “acceptance” by others depended primarily on what you did or did not do And, as you might guess, the list of “do’s and don’ts” certainly did not comprise a biblical list. Rather, it consisted of extra-scriptural activities, most of which were cultural. “Now may the God who gives perseverance and encouragement grant you to be of the same mind with one another according to Christ Jesus” (Romans 15:5, NASB). There is one outstanding lesson we can learn from church history: Satan’s primary strategy involves destroying unity among Christians. He is the author of confusion, insensitivity, false doctrine, and church splits. Turning to the Bible, one soon discovers the power whereby Satan’s strategy can be defeated. It’s the power of “one-mindedness” in the body of Christ. We are talking about a number of “one another” verses in the New Testament that form the basis for community life as disciples of the Lord Jesus Christ. 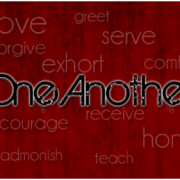 Today, we want to consider the second of the main “one another” verses… “Honor one another above yourselves” (Romans 12:10). Every Christian should strive to make other believers “look and sound good.” Every Christian should rejoice when others achieve, when others are honored, when others are successful. When this happens, the body of Christ will function beautifully and mature and grow in Christ.